A female performer begins the karanga to welcome our guests into the venue. Māori waiata (songs) performed by our performers. 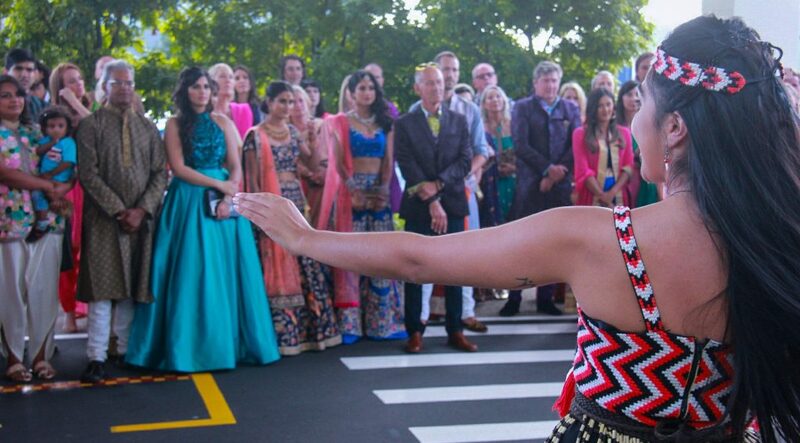 Weddings are one of the many services The Haka Experience provides. 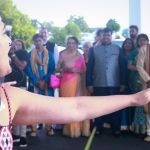 In February 2018, we had the honour of hosting a wedding at the Sudima Hotel in Mangere, Auckland. This was a wedding with a difference – a beautiful Indian bride marrying a handsome Australian groom. The Bride and Groom requested an authentic traditional Māori Pōwhiri for their 200 guests to commence their sacred marriage. The wero (challenge) performed during the haka pōwhiri by one of our Māori warriors. 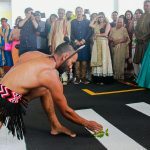 A Pōwhiri is a traditional Māori welcome which comprises of traditional ritual practices, including the pūtātara, the wero and the karanga. The Pūtātara (Conch Shell or horn), a trumpet-sounding traditional Māori instrument, was blown by one of our male performers to signify that the wedding guests had arrived. This begun the Pōwhiri process. Alarmed by the sound of the Pūtātara, the guests were quickly greeted by one of our warriors who performed the wero (challenge). The purpose of the wero is to identify whether the guests come with peaceful intentions or otherwise. 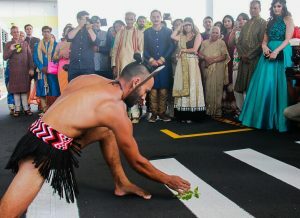 A warrior places a rau (leaf/greenery) on the ground in front of the guests. If it is picked up then it means the guests come in peace. One of our performers (kai wero) presented his skills in the art of Taiaha, a stick-like Māori weapon, followed by the placing of the rau. The father-of-the-bride accepted the rau by picking it up off the ground. The guests then waited to be called into the venue. This part of the Pōwhiri is referred to as the karanga. The Karanga is a process whereby the hosting group (kaikaranga) calls the guests by way of chanting. A female guest responds by chanting, giving thanks to the kaikaranga while slowly guiding the guests forward. As the wedding party were not skilled in karanga, one of our female performers lead the guests and responded for them. The wedding party entered the venue and our group performed a Haka Pōwhiri (Traditional Welcome Haka). 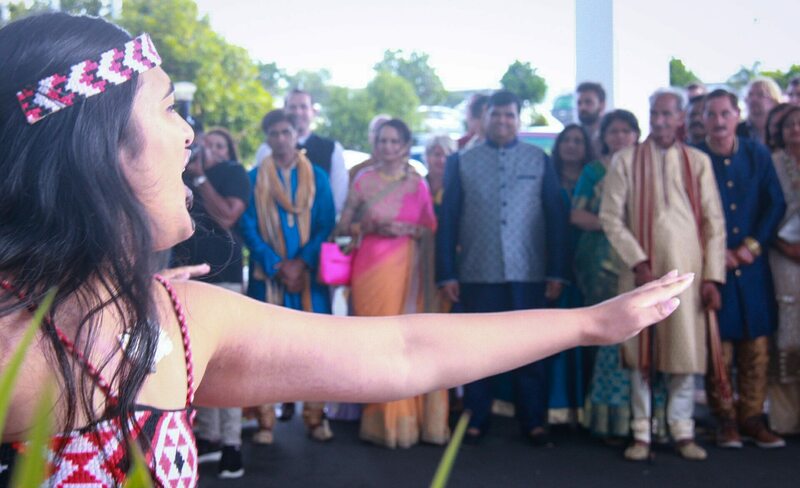 Lastly, our group entertained the wedding party by performing a number of traditional Māori waiata-a-ringa (action songs), poi (poi dance), and haka (war dance). 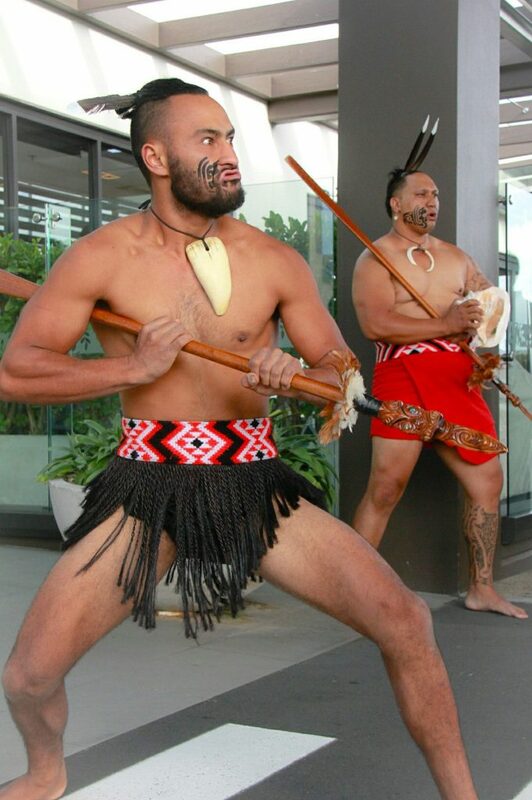 This was a unique kapa haka experience, tailor-made to suit the occasion, one of the many things we do at Te Wehi Haka. Emotional, both families and guests were overwhelmed with joy from the spiritual connections made in that moment of time.